Join H.E. 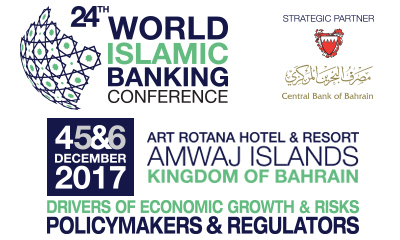 Rasheed Mohammed Al Maraj, Governor, Central Bank of Bahrain and over 1300 of the biggest minds in Islamic Banking & Finance congregate for what is the event of the year at the 24th World Islamic Banking Conference –convened by Middle East Global Advisors in strategic partnership with the Central Bank of Bahrain – where they will discuss key topics gravitating around the theme of “Drivers of Economic Growth & Risks: Policymakers & Regulators”. Register Now to hear insights from Adnan Ahmed Yousif, Chief Executive and President, Al Baraka Banking Group; Taliya Minullina, Chief Executive of the Tatarstan Investment Development Agency & Member of the Investment Council of the Republic of Tatarstan; Adel Abdul Wahab Al-Majed, Vice-Chairman & Chief Executive Officer, Boubyan Bank; Abdulla Mohammed Al Awar, CEO, Dubai Islamic Economy Development Centre; Abdelilah Belatik, Secretary General,General Council for Islamic Banks and Financial Institutions (CIBAFI), Abdul Hakeem Alkhayyat, Managing Director & CEO, KFH Bahrain; Hassan Amin Jarrar, CEO, Bahrain Islamic Bank, Ayman Sejiny, CEO, IbdarBank and other distinguished Islamic finance veterans from across 50 countries, who will shape the future discourse of the Islamic Finance industry. What lies in store for you at the 24th WIBC? Governors’ Addresses; High-profile Regulatory Debate among Central Bankers; CEO panel on growth and profitability; Digital banking-focused Panel on harnessing digital technologies to stay relevant; Discussions on Sukuk vs Bonds, VAT, Financial Inclusion, Regional Economic Outlook, Sustainable Investing & more; Exclusive WIBC Knowledge-Sharing Series focusing on topical issues like aviation financing, renewable energy financing, halal ecosystem; WIBC Gala Dinner and Performance Awards & Exclusive launch of Financial Intelligence Reports.